Smart Tags (or QR (Quick Response) Codes) are like barcodes that can be read by smart phones. These tags tell the phone to go to a certain web site or web page where you can provide all the information you desire, pertaining to your pet. You can update the info on the web page whenever you’d like, including when your pet goes missing, offering a reward or updating your contact information to help your pet return back home safely. If you move, you can update your address on the web page instead of buying a new pet tag with your new address. 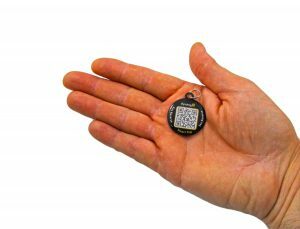 Think of the smart tag as a dog tag that provides a website with all the info you want to provide about your pet, as opposed to your average dog tag that has 3 or 4 lines on it, providing your pet’s name and contact information. After you purchase the smart tag, you activate it through the manufacturer’s web site, attach the tag to your pet’s collar, then add your pertinent information on the unique web page associated with the tag. If your pet is lost, the person finding the pet will have easy access to your contact information and any other important information that you entered on the tag – simply by visiting the unique web address of the tag by scanning the QR Code with their smart phone. The web address is also printed on the tag so the person finding your pet can access your page via a web browser if they do not have a smart phone or a QR Code reader app on their phone. The tags are ideal for cats due to their small size and light weight. Smart tags are a very cheap alternative to GPS tracking devices in that they are cheaper to purchase, have no electronics involved in them, and have no monthly subscription fees.. The drawback is that you are counting on someone finding your pet and contacting you, as opposed to a GPS tracking device where you can be proactive and immediately track your pet yourself as soon as it goes missing. Dynotag is the leader in smart tags. The tags have advanced features such as keeping an access log only the owner can see (with time stamps and location coordinates when available) of others viewing your tag, and providing a zoomable map showing the last view locations as a pin map. Dynotag also provides automatic view notification e-mails (with location coordinates when available) when your tag is viewed. Although the tag itself contains no GPS features, the location of where the tag was viewed is accessed via the coordinates provided by the cell phone used to read the tag, if the cell phone owner has the app set up to share their location. Below is an example of what a dynotag QR Code would look like, along with the unique web site name printed on the tag. You can access the pet’s information created by the owner by using your QR app on your phone to read the QR code on the screen, or click the link to access the pet info. This smart tag will help you find your pet within a 200 foot radius. You can even set up a virtual leash and receive notifications if your pet strays. You can invite anyone such as friends, family, dog walkers, pet stores, and neighbors to install the free Pawscout app on their phones. If your pet does go missing, you can send a digital lost pet to those people so that they know to look for your pet. This smart tag works off of Bluetooth technogolgy and can be used on dogs and cats of all sizes. It’s standard watch battery life is 12 months. The tag weighs 10 grams. There is a one time purchase fee with no monthly service fees.